“Kind is the New Cool ” “Love is the Way ” Peace and joy and happiness by products of reaching out to understand each other. Act today with more love, more kindness and more grace and the world will continue to bend toward justice. Set your sails for peace, today, now always, know the joys of harmony with yourself and the world at large. We are in a great time of change of conscious reasoning. We do not need an amplification of hate, but a civility of discourse. We do not need a churning of fear that leads to suffering, we will be extending love.We need more education, more civility, more compassion, more education, more understanding, more connection. 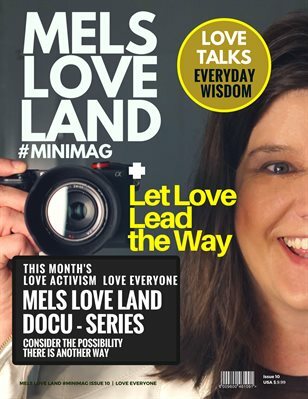 This issue offers more on Mels Love Land, exercises in Forgiveness, affirmations for meditative time and lots of inspiration to guide the way. It is our time to rise up and stand for our human brothers and sisters to showcase how love leads the way, that our hearts vision of peace is possible, that kindness is cool and that we do not need to have more so others can have less. We can care for each other and provide for the common wealth. As we continue marching and standing for love and human rights and justice look around you to see a world of peace and safety and joy. To download a free pdf of Mels Love Land go here.